When Should You Replace Your Tires in Victorville? Many reputable tire manufacturers remind drivers that their tires should be thoroughly inspected at least every five years; however, this only applies to new tires under conditions that could be described as neutral. Your daily driving habits, the load carried by your vehicle and the conditions of the roads you usually take will determine when you should replace your tires in Victorville. 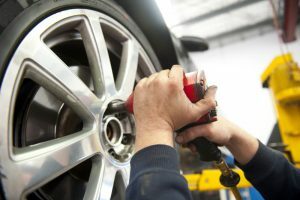 There is one particular factor that you should know about driving in Victorville and the High Desert: When it comes to tire replacement, auto shops such as Road Runner Auto Care in Apple Valley are among the busiest in the country, and there is a geographical explanation for this. It so happens that Victorville and Apple Valley share some climate characteristics with parts of Arizona, Nevada and Utah. Desert conditions tend to greatly impact all rubber parts in your vehicle; this includes your tires, windshield wipers and gaskets, but particularly your tires. Once dry heat reaches a temperature above 72 degrees several days in a row, the pounds per square inch (PSI) reading of your pressure gauge should be adjusted accordingly. This is something that auto technicians at Road Runner Auto Care evaluate whenever a car is brought in for service; moreover, the technicians will visually inspect the tires very closely as the seasons change. What happens in places like Victorville is that your tires tend to age more rapidly. If you purchase a new car, you may need to start making plans to replace the tires in less than five years, particularly if you are a high-mileage driver or if you encounter off-road conditions from time to time. You cannot rely only on a tread inspection if you drive around Victorville on a daily basis. You need to take a good look at the outer and inner sidewalls and check for cracks that may be developing due to climate conditions. It is better to be on the safe side and perform a thorough inspection at 40,000 miles. Drivers who purchase used cars in Victorville may need to replace their tires sooner than they expect. Unless you have access to the service logs and can see the maintenance performed on the tires. You may feel a slight vibration and think that a front-end alignment is required when in reality your tire bands could be separating. In the end, you should ask an auto technician at Road Runner Auto Care tell you more about Victorville tire replacement.